I am working on a gothic vestment of silk dupioni with china silk lining. It's my first time sewing with silk! # 1 It has been suggested to me that I underline the facing fabric with an oxford shirting type cotton fabric (to reduce wrinkling and improve drape). When I test the "hand" on this, it seems inordinately bulky . . . Would organza be better? And could it be synthetic, in order to keep down costs? #2 I cannot get the china silk lining to keep a straight grain, while I cut it. Do you have any suggestions? 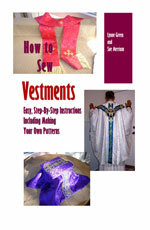 #3 Above all, I really want the lining of this vestment not to sag. I am concerned: Having three layers to the vestment, there is even more possibility of the fabric layers not lying flat. Do you have any tips for me? We seldom work with silk for the simple reason that it is so difficult to work with and incredibly hot. Therefore, my advice to you is to not line the chasuble at all.Make a small role hem at the bottom and add a small facing around the neck instead. As for your question about synthetic fabrics, You can certainly use synthetic fabrics. At one time, they were not allowed in the church, but things have changed, and church officials recognize the value of synthetic fabrics. Hope this helps and may God bless you richly in your sewing efforts.